Last weekend found us at one of our favorite little local markets. We were a family on a mission. An apple cider doughnut mission. There are other places in town that make apple cider doughnuts. But no one makes them like this place. So there we were, standing behind the little glass half-window watching as those glorious bits of dough were being dropped into the hot oil and rolled in cinnamon and sugar, our mouths salivating as the wonderful aroma wafted all around us. And I completely understood why she would ask that. I mean, out of all of the flavors they make all of the rest of the year, the apple cider doughnuts are the best no contest. 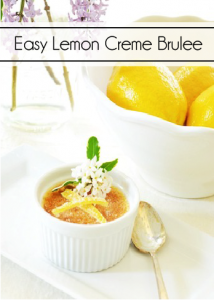 Sweet with just the right amount of spice. But, as I explained to her, there is something about knowing that you can only get them at this time of the year. When you bite into the warm, soft dough I think you savor it a bit more because you have this awareness of how fleeting it will be. And I think that’s how I feel about Autumn. It’s because we only see the vibrant colors of the trees and the pumpkins on porches and the fields filled with row after row of corn stalks for just a little while that it’s all so special. It would lose some of its sacredness if it was always like this, don’t you think? 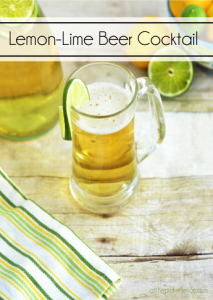 So, we have to relish it, savor it, bite into the deliciousness of it because before we know it…it’s all over. But, it will come back again next year bringing with it all that the season has to offer. Especially those apple cider doughnuts! 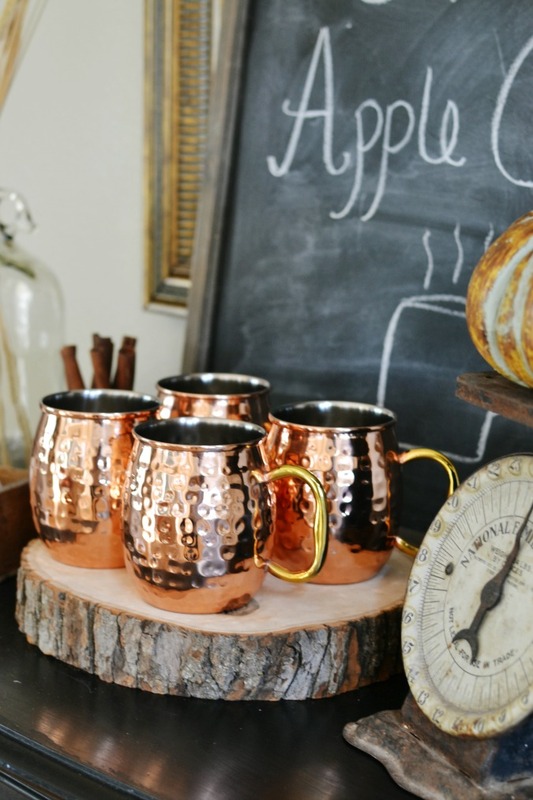 Now, I love apple cider so much that I decided to dedicate a little section of my home to it. I found the chalkboard buried in the clearance section of a store, apparently put there because it had a crack in the frame. A little bit of glue and it was good as new! Would you like to see some more thrifty finds? 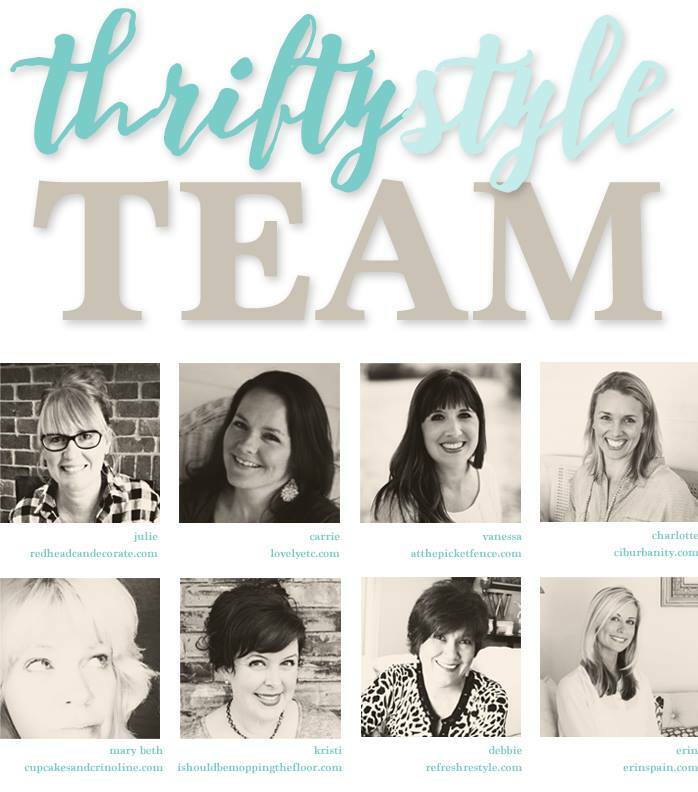 Visit my friends on the thrifty style team! 13 Comments on "Hot Apple Cider Station"
You must be talking about EZ Orchards…..I forgot about the apple cider donuts. You are spot on about limited availability making something special. I’m going to re-arrange my day and get over there for donuts and of course some produce and who knows what else I will find in the gift section. Thanks for the reminder embrace everything about this new season. I’m sitting in line picking the girls up, and you can guess what’s in the back. You guessed it! Cider. I may go chug a gulp. 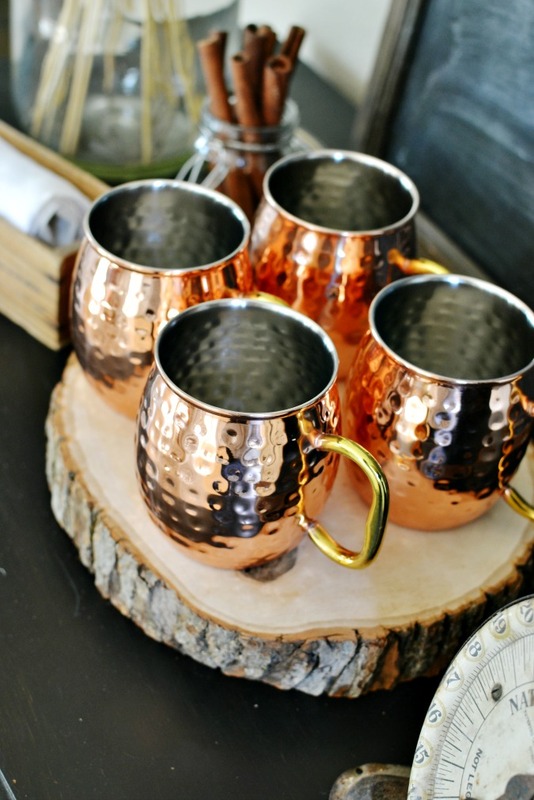 Beautiful copper cups, and I agree with every word! How adorable & now you have me craving hot cinnamon donuts & cider !!! I love it all, but that pumpkin & scale are awesome!!! There is a particular apple orchard we travel to in the Fall…and they have the best apple cider donuts…We get a dozen and for the most part they are gone by the time we get home…I must say we have a long drive 🙂 yes..they say Fall….love your Apple Cider station! I’ve never had apple cider doughnuts on my trips to the States. 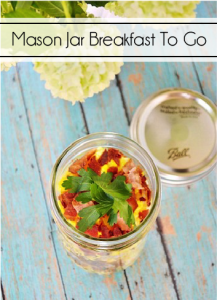 They do sound yummy! I do agree with you about you appreciate things more if they are only available for a short time. I feel the same about Starbucks Spiced Pumpkin Lattes! 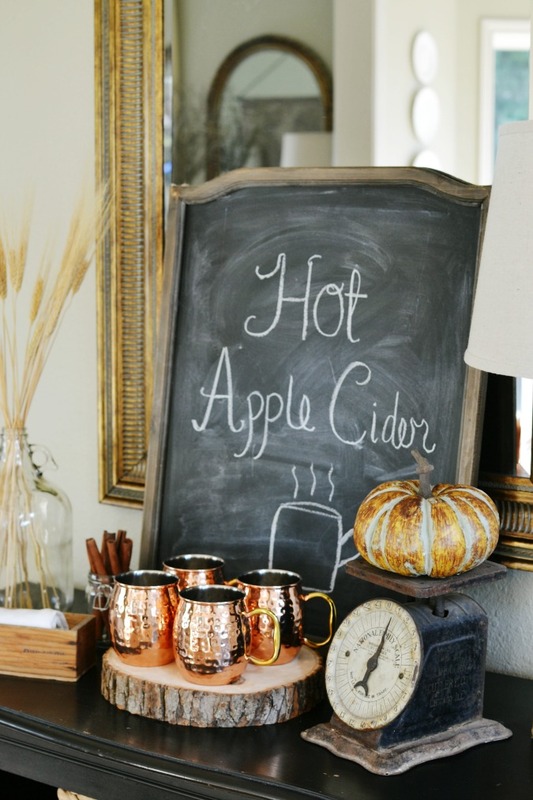 Love your Hot Cider station. Great styling! I have never had an apple cider donut but boy do they sound delicious! 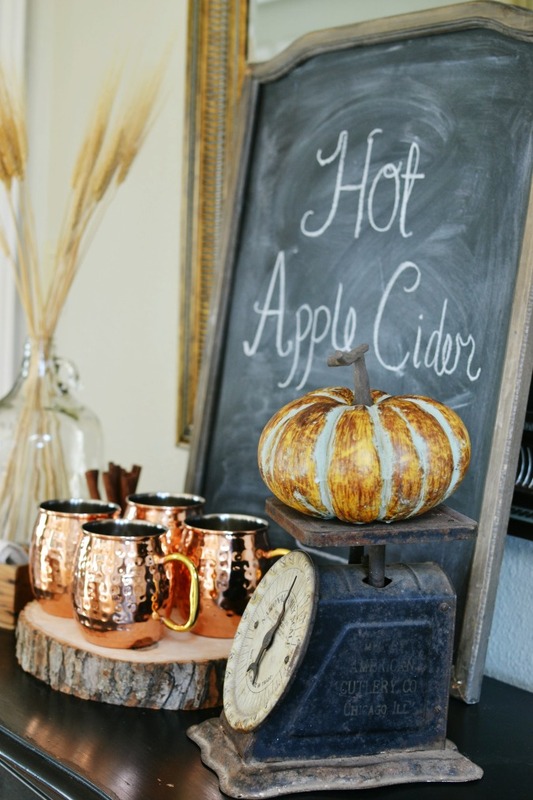 I love your hot cider station – it’s perfect for the beautiful days of autumn. I love this little corner of your home! 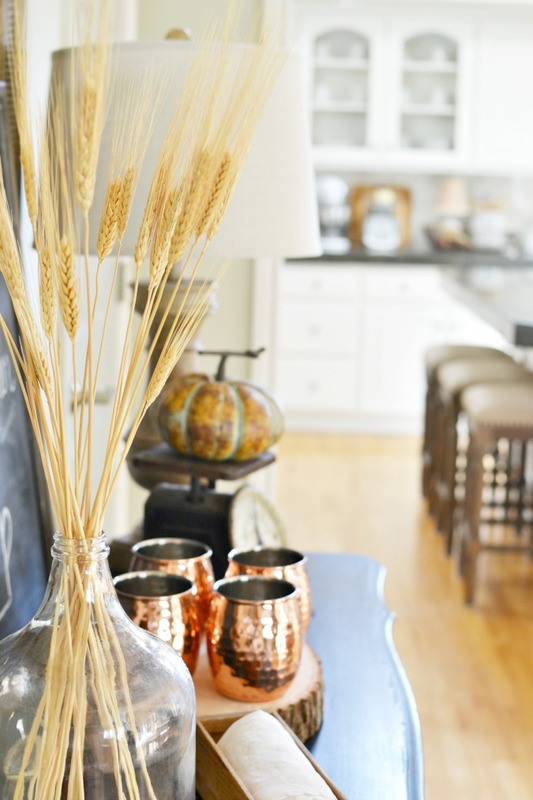 Where did you buy your copper mugs and the clear glass jug holding the tall wheat? Beautifully done! Wonderful cider station – won’t be long now and the days won’t be so HOT and I can then again think of cider sippin!